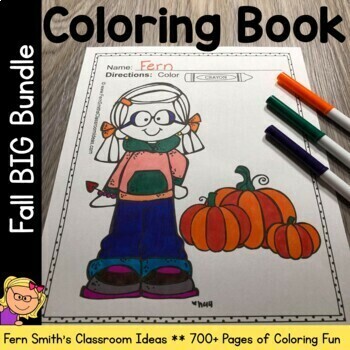 Fall Coloring Pages Big DISCOUNTED Bundle! This DISCOUNTED bundle comes with a SUBSTANTIAL DISCOUNT of less than 3 cents a page compared to purchasing each resource separately. Your students will love how this coloring pages bundle has over 700+ pages of Print and Go Coloring Pages for Back to School, Fall, Apples, Vowels, Pets, Cute Kids, Fire Safety, Halloween, Columbus Day, Spiders, Bats, Thanksgiving, Hanukkah, Kwanzaa, Christmas and Classic Children's Stories, more than enough for an entire semester! Bind different pages together for your treasure box or an adorable Christmas gift! Color for Fun First Semester Bundle for July to December. This DISCOUNTED bundle comes with a SUBSTANTIAL DISCOUNT compared to purchasing each resource separately. Color for Fun Long Vowel Fun! Color For Fun Printable Coloring Pages! Color for Fun Short Vowel Fun! Color For Fun Printable Coloring Pages! Color for Fun Family Pet Fun! Color For Fun Printable Coloring Pages! Color for Fun Back to School Fun! Color For Fun Printable Coloring Pages! Color for Fun, Apple Fun! Color For Fun Printable Coloring Pages! Color for Fun, Cute Kids Fun! Color For Fun Printable Coloring Pages! Color for Fun, Fall Fun! 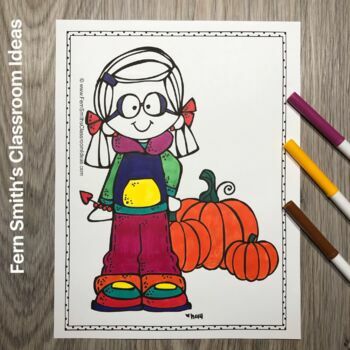 Autumn Color For Fun Printable Coloring Pages! Color for Fun, Fire Prevention and Safety Fun! Color For Fun Printable Coloring Pages! Color for Fun, Columbus Day Fun! Color For Fun Printable Coloring Pages! Color for Fun, Spiders and Bats Fun! Color For Fun Printable Coloring Pages! Color for Fun, Halloween Fun! Color For Fun Printable Coloring Pages! Color for Fun, Thanksgiving Fun! Color For Fun Printable Coloring Pages! *Use as morning work to work on fine motor skills. *Place at a center to work on fine motor skills. *Staple one or more pages into your weekly homework packet for a little fun and joy! *Use as a reward for the weekly homework being turned in. *Use as a story starter. *Use on Fun Friday if everyone finished their work. *Staple one page into your weekly homework packet for a little fun and joy! *Staple 5 to 10 pages together for a treasure box coloring book. 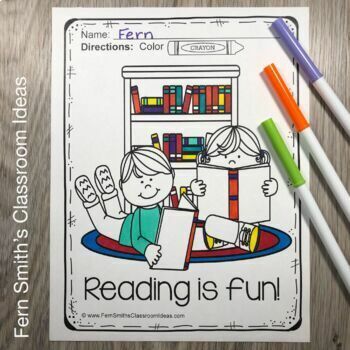 Click here to see all of my Color for Fun Resources! Print all the pages and bind together for your students for a literacy center writing book. Color for Fun, October Fun! Four Pack of Printable Coloring Pages! Color for Fun, Family Pet Fun! Color For Fun Printable Coloring Pages! Color for Fun, Fairy Tale Fun! Color For Fun Printable Coloring Pages! Color for Fun, Back to School Fun! Color For Fun Printable Coloring Pages! Color for Fun, Christmas! Color For Fun Printable Coloring Pages! 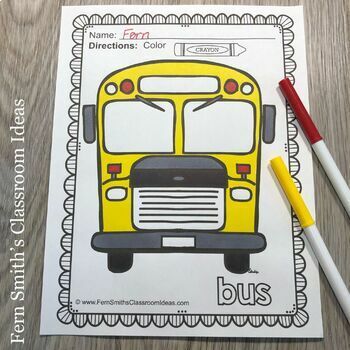 Terrific for your Emergency Sub Tub for morning work, let the substitute have a few minutes to read your plans while the children color! Click here for ALL my Color By Numbers / Color By Code Resources for some coloring fun & skill reviews! ** If you have purchased this resource in the last three months... May1st to August 17th, please email me FernleySmith@gmail.com for an instore credit. Include your date of purchase, username and order number. Special Permission for the graphics in the Color For Fun series has kindly been granted by the following artists. I invite you to follow their blogs and TPT Stores with the links below.